Here come the holidays again! Where did the time go? 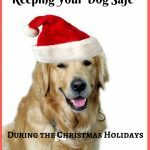 Whatever religion you are, or customs you follow, while decorating your house for the festivities this year, and planning your feasts for family and friends, please consider these pet safety tips for the holidays to keep your pets safe and keep you from heartbreak. You may have already put up the Christmas tree. 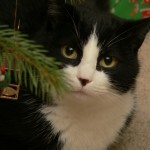 The best place for your tree is someplace where your pets can’t get at it and tip it over. The corner is a good bet. Although manufacturers of tree lights nowadays make them so they don’t overheat like they used to, you still want to do everything you can to prevent a fire. Another danger with Christmas trees lights and electric candle sticks glowing in the windows is the electrical wiring. We know how much our pets like to chew and gnaw at things, and electrical wiring could be a killer. Animals have been known to be badly hurt from burns, or even killed from the electricity. Skip the tinsel. It can cause serious intestinal blockages in pets if ingested. Also, please don’t decorate with popcorn or cranberry for the same reasons. We like to give our pets scraps from the dinner table, don’t we? But be aware that some foods are harmful or toxic for our pets. For example, did you know that raisins and grapes are dangerous for dogs? So is chocolate and treats sweetened with xylitol. Turkey and its skin can cause life-threatening pancreatitis, according to the American Veterinary Medical Association. Rich sweets, heavy foods, and fatty gravies are difficult for dogs to digest and can cause painful gastric issues. Throughout the holidays, feed your dog the food he normally eats, stop him from begging at the dinner table. 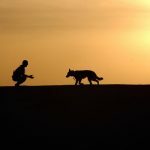 If your dog is anxious around people or loud noices, it might be best to leave him in another room, or in his dog crate. Just make sure he has plenty of water and a toy to keep him busy and happy. Holly, poinsettia, amaryllis, balsam, cedar, pine needles and mistletoe are toxic or dangerous to dogs. These are just a few of the long list of plants that spell disaster for your pets. Keep holiday plants on the mantle or high shelves and vacuum fallen pine needles from the Christmas tree frequently. It goes without saying for sorts of dangers lit candles can be. 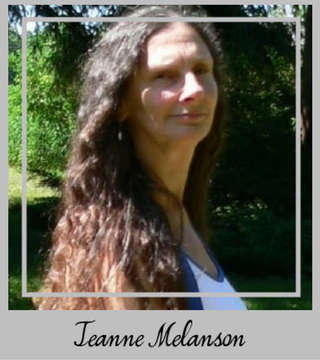 Keep them out of reach of your pets (and small children). 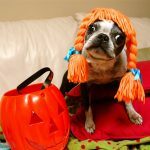 Paper, ribbons or bows can be a danger to you dog’s digestive tract. 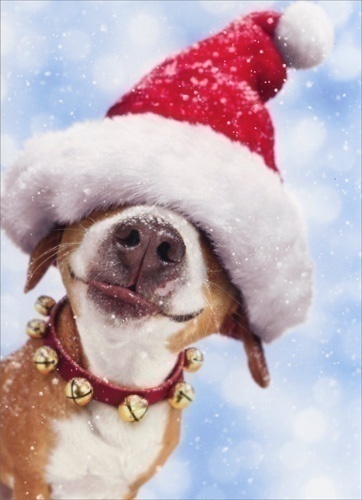 If you offer your pet a gift, make sure you supervise to make sure he stays safe. 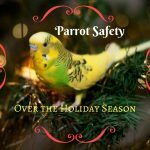 I hope these Pet Safety Tips for the Holidays helps you and your furry or scaly friends to have a happy holiday season. A QUESTION FOR YOU: How do you celebrate the holidays? I’d love to hear it. 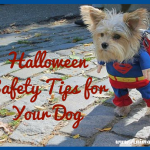 These are great tips to remember to keep pets safe. Mom usually goes upstate to spend the day with her family. This year there is a new baby in the family! Congratulations to the family on the new baby! How fun! Thanks for stopping by, and stay safe!